The next day we tried to get an early start, but like on most days people are interested in meeting us and it always takes longer. We got a free coffee and hot chocolate in the Sailing Club before departure. On the water we had the wind with us for about 30 min. then it turned against us and it took a lot longer to reach the Cap. Cap Portofino was a very nice experience and we could sail right next to the cliffs, because the wind died down. Still a lot of reflex waves about 1m high but not a problem. It was getting dark and the only option was to continue – the kids were not very happy!! After 10 min. on the water the darkness closing in and with a few boats still on the water, we turned on our emergency lights on our Kokatat lifejakets, to be visible to others. 20 min. later we spotted what we thought was a beach, coming closer we could see, lighted up by the street lights, that we were right. I stood up in the kayak to get a better look at the beach and to try spot the best landing site. In one place the water ran up a little further on the beach, meaning this must be the flattest part of the beach and the best place to pull up the kayaks. Liva was with me on the kayak and we landed on the beach in calm conditions, the last wave lifted us up and we are on the beach, but a little too far up so that I can’t get the fender under the kayak. Having used my back a lot the last few days, I told myself to lift the kayak with my legs and not my back. We had just got water and supplies, and the kayaks are were loaded to the maximum. I had to give it everything to lift it. Just then I felt a snap in my back and I sat down on the beach with a scream. Liva comes running, asking with a anxious voice “are you ok dad?” I told her that my back was hurting. She tried to lift me up but I couldn’t. I’m just trying to hold on to the kayak to prevent it being pulled out to sea again. And with every little wave that comes in, I feel an intense pain in my back and down through my legs, While sitting there waiting for Suzi to reach the beach, I thought this is not good and the scary thought of “is this the end of the trip?” passed through my head. I told Liva to get the rope out of the kayak and a moment later she has the rope ready – awesome girl. I let the kayak drift back and forth in the waves and found a stick in a wall to tie the kayak on to. Suzi came in and she got the pulling system out. We set it up and Suzi pretty much pulls in the kayaks by herself – there was little I could do to help. With the kayaks safely on the beach we set up camp. Next day I got help from Luca who came to take pictures of us and to do an interview. He pointed me in the direction of Anna Ghiglione, a physical therapist, and friend of Luca’s who rescheduled her day and gave me a free treatment – really, really nice. The question was “what do we do now?”. We couldn’t move so the plan was to wait. But two days later the police came and kindly asked us to remove the tent and our camp. They said we can still be on the beach if we want to. I tried to tell them about our situation, but they told us we could stay but without the tent. This was not a workable situation, and we slowly packed our things and tried to call Luca to find a place for the kayaks. He quickly called back and was on the case. 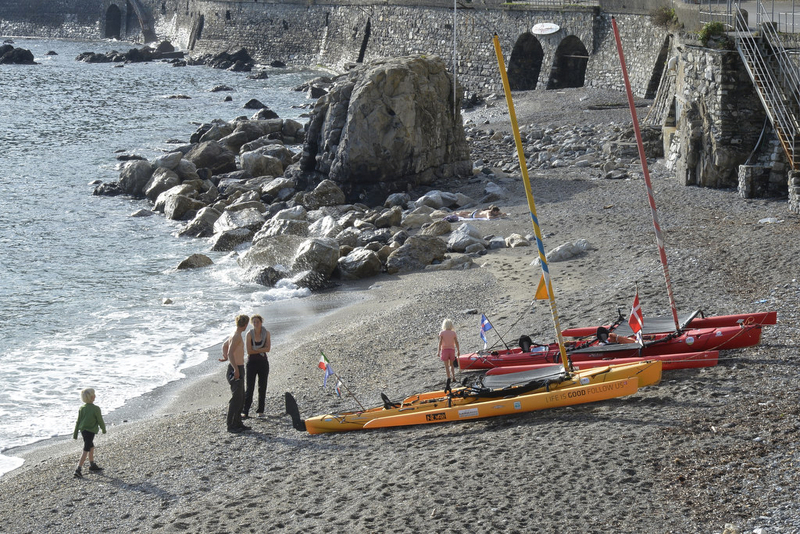 At the same moment, a guy called Danilo, together with his wife and daughter, walked on to the beach and asked me about the kayaks and if I could take picture of them swimming in the sea. Danilo has a boat and I explain our problem. He wanted to help and said that the club had a space that they were not using during the winter. I called Luca to tell him that Danilo is helping us and it turned out that they knew each other. Together with Danilo we drove into Santa Margarita to see the place. Here we talked to people from the Sailing Club. Danilo made a few phone calls. A couple of hours later, we sailed the kayaks into Port Santa Margarita only 2 km away and with the help from Lega Navale, the kayaks were placed on land. Luca came to pick up our luggage and find a hotel for us. Meanwhile we were invited to the Christmas end of the season party, in the Sailing Club were we talked to a legend in Italien sailing sport: Pietro D’Alì. Back at the hotel, we considered our options and decided to book a flight to Suzi’s parents’ home in Holland – we could do with a break. Good report on what happens to you. This is the main risk of that kind of adventure but you were very lucky to find so many good and helpfull peoples, including the policemen ! You have taken the right decision because, has you said, this is on earth that you have to do the worst things like removing twice a day your heavy stuff. A bed during few weeks and the adventure will restart again for you and your followers ! Good luck and happy new year. god bedring, det er aldrig godt når ryggen gør knuder. Håber i er velankommet til Suziis forældre. Godt Nytår til alle. Hvordan gik det med dine forældres cv, fandt man vognen? Jullie ook de beste wensen voor 2015! Nog een nieuw ‘projectje’ meegenomen voor de schuur in Nederland? Ha,ha, dat je dat nog weet! Het paste niet in de camper, Joop is nu met een ander project bezig een Zundapp Bella uit 1958 het is een motorfiets. Ik hoop dat je rug snel hersteld zodat de reis door kan gan. Als het niet zo afloopt kan je desalnietamin zeer trots zijn over wat jullie toch hebben gedaan. Een reuze tocht. Ik zal over jullie gezin denken iedere keer dat ik weer ga kajaken in m’n eigen Hobie TI. Alle goeds gewenst voor 2015 voor jullie allemaal. Laat je eigen maar even verwennen door de ouders. Hopelijk is je rug van voorbijgaande aard, en mogen jullie je reis tzt vervolgen. En als het niet zo is, tot zover een prestatie van jewelste.